Living Social and Groupon are relatively new websites featuring coupons and advertisements which target your local demographic. Some of these coupons are backed by large names, such as Amazon, whereas others may be small businesses, like “Joe’s Pizzeria” down the road. These sites are growing in popularity, even Google recently offered Groupon $6 billion to acquire it (this was turned down). 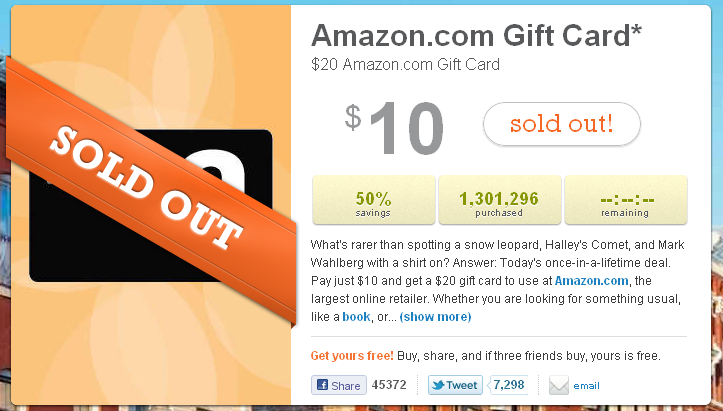 Yesterdays coupon on living social was a $20 gift card being sold for $10. Over 1.3 million gift cards were sold, as you can see in the image above. This equates to approximately $13 million gross for Amazon.. Historically, individual products are marked up by retailers to cover their costs. Discounts on products simply lower the mark-up and in many cases there is still profit realized even when an item is “on sale”. With e-commerce, many direct drop-shipping techniques have reduced the mark-up, however, shipping, freight and warehousing competition has increased the wholesale costs so the effect is relatively the same for the consumer. Ask yourself, who makes more and less out of this scenario? Amazon is fairly unique in the e-commerce world, with the exception of Overstock and similar others; they sell and warehouse their products directly. This allows them to ascertain profits on much lower prices since their wholesale savings are much greater. Selling a $10 coupon worth $20 in Amazon credits is not profitable for an item which is marked up less than double its value, but for many small items, such as Amazon’s Kindle books… there is almost no cost at all, so sales for almost any amount usually equates to profit. What would you rather purchase, 8 books at 50% off, or 2 DVD’s at 50% off? Either way, these small items cost little or nothing to reproduce, so margins are high regardless of the price. If you bought yesterday’s coupon, but had no intention of buying anything on Amazon, my advice would be to save it until you actually need something from Amazon then use it in conjunction with your normal purchase. Imagine a large warehouse where everything you would like to purchase is stored (kind of like walmart)… There’s no need to walk down endless aisles looking for goods, because there are computer terminals easily accessible from multiple entryways where you can request a specific good which is sent to you via a pneumatic tube for you to inspect before buying. If you approve the purchase, you send it back in the tube and mark off on a list of inspected items which ones you want to buy. A box or other container is now dropped off via conveyor belt or by other machinery like warehouse robots with your requested items. You can choose to take it back home with you (that’s why you came to the store in the first place isn’t it?) Or have it shipped via any shipping method you choose. Posted on January 20, 2011, in General Discussion, Tech News and tagged $1.3 million, $13million, 1, 1301296, 296, 301, ad, advertisement, amazon, amazon makes 13 million, amazon sells 1.3 million, buy, capitalize, coupon, ecommerce, gift card, giftcard, groupon, growth, living social, livingsocial, market, marketing, purchase, sem, seo, shop, shopping, sold out. Bookmark the permalink. Leave a comment.